This review of two thesauri was performed by Amy Proni (now Amy Ranger) for the course ILS-531, Indexing and abstracting, taught by Dr. Y. Q. Liu, Southern Connecticut State University, Spring, 2005. Assignment: Thesaurus review. Using the concepts you have learned, find 2-3 existing thesauri and write a short review paper. First, illustrate the construction, use of terms, and main characteristics of the thesauri, then compare their major merits, shortcomings and differences. Authority. Prepared by the staff of the National Agricultural Library, Beltsville, Maryland, to meet the needs of the United States Department of Agriculture (USDA), Agricultural Research Service (ARS). Description. This thesaurus comprises 63,877 total terms (41,128 preferred terms, 94 node labels, 22,749 lead-in terms) in 17 subject categories. It includes scope notes, definitions, and provides hyper-links to related terms and a search option for the referenced term in the National Agricultural Library Article Citation Database. Date. Developed in 2003; retrieved February 26, 2005. Purpose. Serves as the controlled vocabulary of the National Agricultural Library bibliographic database of citations to agricultural resources, and of the information system of the Food Safety Research Information Office and the Agricultural Network Information Center. Scope. Organized into 17 subject categories derived from the NAL Agricultural Classification Prototype developed for the Agricultural Information Network. These categories include: Farms and farming systems; Rural and agriculture sociology; Government, law and regulations; Economics, business and industry; Plant science and plant products; Breeding and genetic improvement; Health and pathology; Forest science and forest products; Animal science and animal products. Additional categories are: Insects and entomology; Natural resources, earth and environmental sciences; Food and human nutrition; Biological sciences; Taxonomic classification of organisms; Physical sciences; Research, technology and engineering; and Geographical locations. The subject scope of agriculture is broadly defined and includes terminology in the supporting biological, physical, and social sciences. Biological nomenclature comprises a majority of terms in the thesaurus; political geography is described primarily at the county level. Relationships. Hierarchical relationships indicated by BT (broader term) and NT (narrower term). The broader term represents more general concepts than the subordinate narrower term. An equivalence is made when two or more terms represent the same or nearly the same concept, such as synonymous terms, common names of organisms and their scientific equivalent, spelling variants, usage variants, and acronyms. Equivalence relationships are designated by "Use" and "Used for" cross references. An associative relationship is made between terms that are conceptually related but are neither hierarchical or equivalence relationships in nature. Associative relationships are designated by "Related Terms" reciprocal relationships. Associative relationships serve to alert indexers and searchers that there are other related concepts in the thesaurus that may be of interest to them. Comments: As the primary focus of this thesaurus is agriculture, it is no surprise to note the agriculturally-related terms of sheep. The NALT is easy to use and relatively easy to understand; I especially like the ability to search for articles that contain the referenced term. The user interface is utilitarian; it is a streamlined tool designed by government workers for government workers, and nothing fancy or excessive is included. In my opinion, the depth and breadth of the subject matter makes it quite useful for individuals researching agricultural topics. Title. ThinkMap Visual Thesaurus, version 3.0.0, ©2005. Authority. Developed and published by ThinkMap, Inc., a company that develops and markets software that uses visualization to facilitate communication, learning, and discovery. Description. A visually displayed arrangement of words with the defined word in the center, and relational words or phrases positioned around it. An audio option allows the user to hear the word pronounced, in British English or American English. Available for $2.95/month or $19.95/year for subscription to the online edition or $29.95 purchase for the desktop edition. Institutional pricing and multiple log-in options also available; a minimal number of free searches may be made during an evaluation period. Date. Retrieved February 27, 2005. Purpose. General use, appropriate for all ages; the user interface and visualization mechanisms allow end-users to browse and understand complex information more effectively. Scope. Includes over 145,000 words and 115,000 meanings. A beta-test foreign language option includes over 125,000 words in Dutch, German, French, Italian, and Spanish. Content may be filtered at four different levels: Level 3, most restrictive (filters words and meanings that may be inappropriate for children); Level 2 (filters obscenity, profanity, slurs, blasphemous terms, and slang terms for drugs; default setting); Level 1 (filters profanity only); Unabridged (no filters). Relationships. Includes 16 kinds of semantic relationships: Antonym, Is a Participle of, Is Derived from, Pertains to, See Also, Is Similar to, Attribute, Entails, Is a Type of, Is a Part of, Is Made of, Is a Member of, Verb Group, Domain Category, Domain Region, Domain Usage. The main display of the Visual Thesaurus depicts the word that was searched in the center, and related words or phrases positioned around it. Words are connected to meanings by solid lines. All words connected to the same meaning are synonyms. Meanings are represented by circles, color-coded to indicate their part of speech. Four parts of speech are represented (red for nouns, yellow for adjectives, green for verbs, dark gray for adverbs). Antonyms are connected by dashed red lines. Meanings are connected to other meanings by dashed lines. 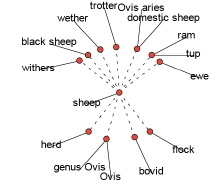 The dashed lines indicate that “sheep” is a meaning of the surrounding words; synonyms are indicated where 2 words or phrases are parsed from the same red circle (for example: genus Ovis and Ovis; domestic sheep and Ovis aries; ram and tup). Comments. It is not surprising to note related terms in the form of other meanings (follower, simple and simpleton, as well as the other nouns used for sheep: herd; genus Ovis, Ovis; bovid; flock) as this thesaurus is much more general in nature than the NALT. What is surprising is the lack of overlap between the two thesauri: ewes, rams, wether / wethers, Ovis aries, and Ovis. This is probably related to the relative size of the dictionaries used, as well as the needs of the users (scientists or other professionals versus the general public). Conclusions. The Visual Thesaurus, available by subscription or purchase ($2.95/month or $19.95/year for the online edition; or $29.95 for the desktop edition), is likely to win awards for style, design, and utility. Users have the option to view the results in two-dimensions, or in 3-D, and may rotate the image for an entirely different perspective. I think that for the general user, this is an excellent merger of technology, design, and utility. On the other hand, the plain but useful Thesaurus of the National Agricultural Library is something that should be bookmarked for use by librarians working in reference or government documents, or students and researchers involved with the myriad topics related to agriculture.